Every day I visit my garden to see what's going on. To see what is thriving, to see what is not. 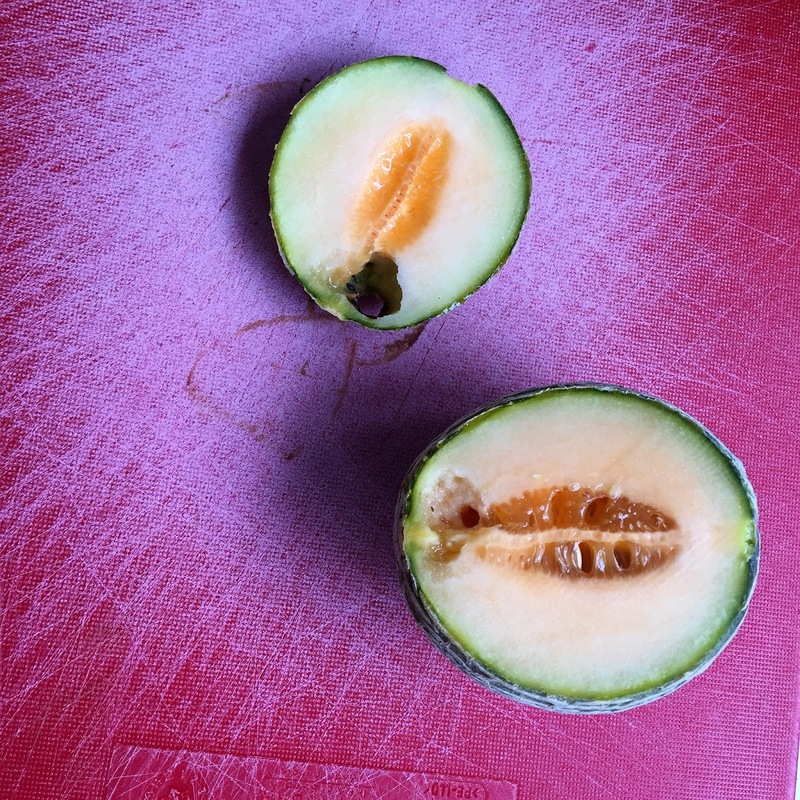 Ages ago, rather than putting them in our compost bin, I buried some cantaloupe / rock melon seeds in our vegie patch. 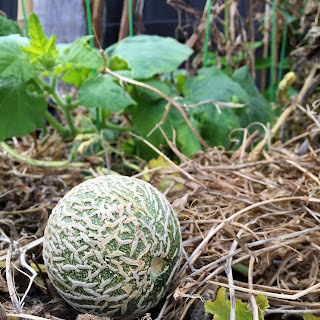 Over time a vine grew, and little teeny weeny cantaloupes began to appear. At one stage on a morning garden visit, I counted nine, varying in size from tiny to the size of a baseball. 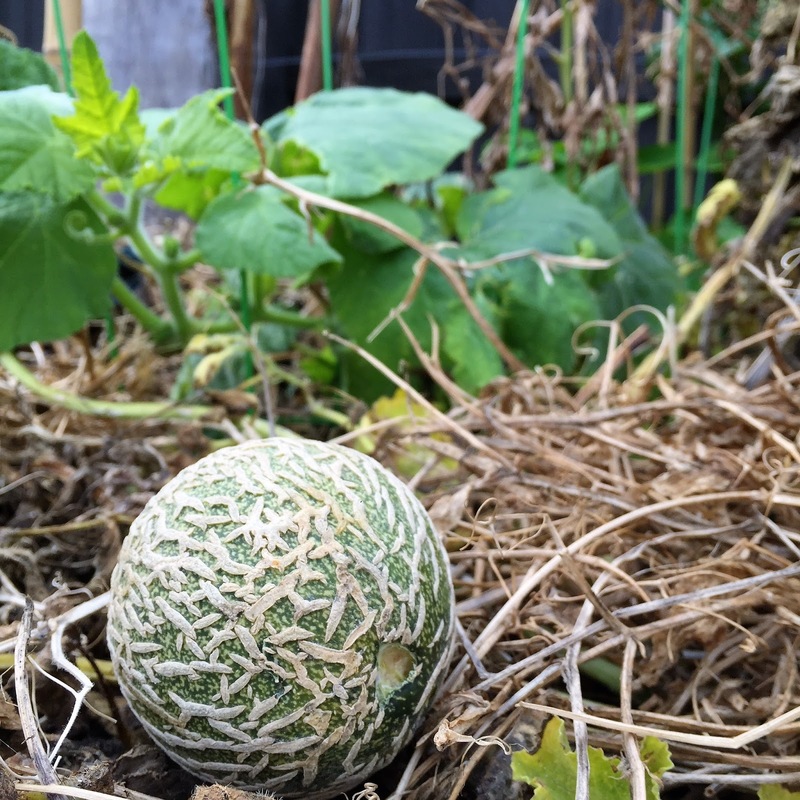 Other than watering them and placing some old, dried sweet pea vines underneath, these melons have pretty much been left alone. Each day I'd check to see how they were going, thanking The Universe and Gardening Spirits for their Blessings. The past week I've noticed that two in particular almost look ready to eat. It's a fine balancing act between letting them ripen just enough, and not leaving them so long that they look tasty to birds, possums and other garden critters. Today, when I went to check on one (pictured) I noticed a little hole, so I picked it, knowing that if I didn't it wouldn't last much longer. But the second? Gone. Disappeared. Nowhere to be seen. How could this be? If a bird or possum had eaten it, surely there would be some evidence? Something? But no, nothing. Not a seed, no skin, no melon. Anywhere. Could a possum have climbed down from the fence and eaten every teeny but leaving not a trace? Perhaps someone in our street decided it looked too good to ignore? So I took my holey harvested melon inside, chopped it up and shared it with a friend, hoping that whoever took the other one enjoyed it as much as we did.